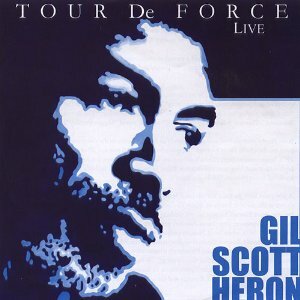 Tour De Force is a live album by Gil Scott-Heron that captures a concert from about 1994. It has been released in a number of different formats and edits but I believe that Tour De Force is the most comprehensive. It’s also the version I bought so it’s the one I’m best qualified to talk about. Let’s take a look at the different versions that exist of Tour De Force. I can only assume that Gil Scott Heron sold the recording rights to a number of different record labels. Only seven songs and some of the chat taken away. All thirteen songs but some of the chat has been edited out. This has twelve of the thirteen tracks and incredibly excludes the song that is probably the biggest reason for Gil Scott-Heron fans to buy the album, the 23 minute version of Angel Dust. I can’t find times for the songs so I can’t give any guidance on the extent of editing. On this version, there are nine tracks. The track lengths are very similar to Tour De Force. Missing are Angel Dust, Shut ’em Down, Alien (Hold On To Your Dream) and B Movie. Eleven songs this time and the chat/songs are severely edited. Missing are Angel Dust and The Bottle. Confusing isn’t it. My message is simple – buy Tour De Force. This is my favourite live album by Gil Scott-Heron because it has such a comprehensive set lit and the performances are strong. Again this is my go-to album when I want to hear the man and I only turn to the other recordings when I’m in the mood to go deep. I have linked to the Amazon reviews for The Best Of Gil Scott-Heron Live rather than Tour De Force because they are better quality. It’s easy to get confused because the album covers are basically the same but buy Tour De Force. You may find a bargain with one of the other released versions of this concert recording but my research indicates that you’ll make a big sacrifice on terms of lost music. Gil Scott-Heron jokes that his albums are filed under miscellaneous and I’m having trouble classifying them as well. I decided to treat him as a singer-songwriter and as a soul artist. Please vote in the polls for the best albums that you’d recommend to other people. have I missed any that should be included? This entry was posted in 1990s Live Albums, Jazz Rock Live Albums, Singer Songwriter Live Albums, Soul Live Albums and tagged 1990s Songwriters, 1990s soul, 1994 live albums, Gil Scott-Heron Live Albums, SS S by Paul Simister. Bookmark the permalink. Angel Dust is a terrific song and I agree, it would be nice to see an extended version of it performed live.